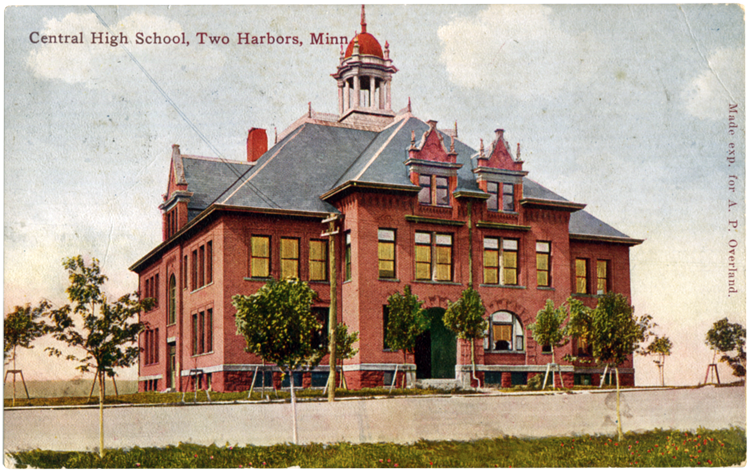 While Two Harbors didn’t have a high school until 1902, the Lake County School District (which included some of what is now St. Louis County) was organized in 1859, just one year after Minnesota became a state. It was managed by Gustav Weiland and had only one teacher, Jennie Clark. Agate Bay didn’t have a schoolhouse until 1883, when $270 was spent on a log structure on a lot that later became the site of the D&IR roundhouse; a “Mrs. Stonehouse” was the teacher. The need for schools grew after the passing of legislation in 1885 making it mandatory for children aged six to sixteen to attend school at least three months a year. Interestingly, many of the students were actually twenty-one years old or older, and most of the teachers themselves did not have a high school diploma. By 1901, a high school was needed, and on February 12, 1902, a new $3,500 building was up at Fourth Avenue and Fifth Street. The school’s three teachers educated fifty students on the topics of arithmetic, grammar, and American history. That year Mary Rylander and Ann Paulson became the school’s first graduates. Enrollment rose, and teachers and subjects were added. By 1910 the school’s nearly one hundred students were learning music, Latin, sewing, and “scientifics” from seven teachers. There was also a course in “domestic services,” and students could participate in athletics (the school had both a football and hockey team), the Debate Team, the Glee Club, and the Foreign Language Club. Twelve students, nine women and three men, graduated that year.